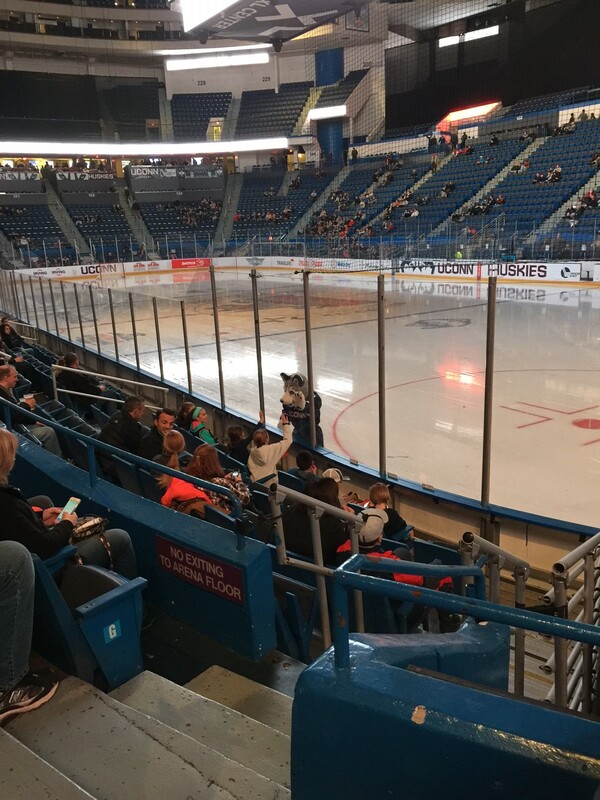 On December 11, I went with my cousins Christine and JC to a UConn Hockey game in Hartford at the XL Center. It was the Huskies’ final game before the Christmas and exam break, who were coming off a sweep of the then-No. 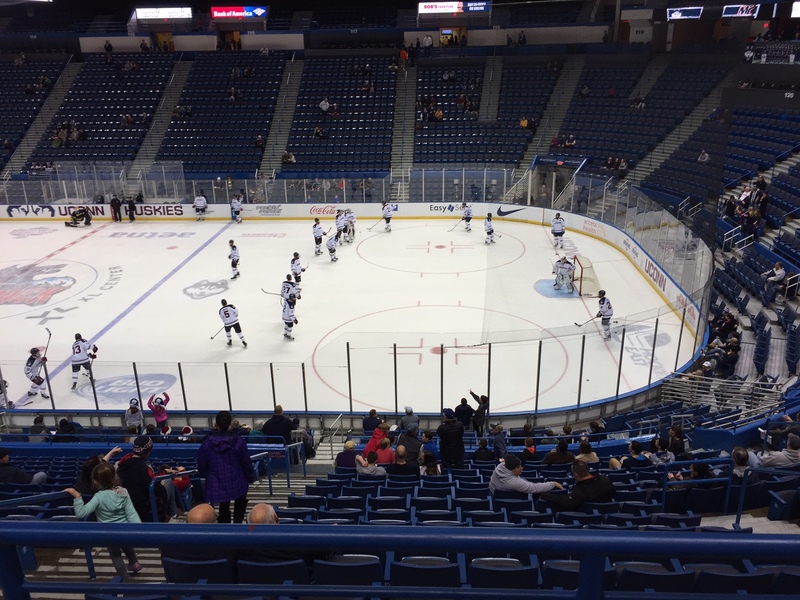 5 UMass Lowell Riverhawks, to snap an eight game losing streak. A win could shoot the Huskies into a tie in the Hockey East standings with not only Merrimack, but also Vermont, New Hampshire, and UMass, putting the Huskies in good position heading into the second half. Since it was such a big game, I was excited to have gotten tickets to this game from my cousins for my birthday. Before the game, we went to Bear’s Smokehouse Grill, our new-found favorite restaurant to go to when attending a hockey game. Our meal was just as good as the past time we went. I ordered a kielbasa sandwich that was superb, mainly because of the amazing barbecue sauce that the sandwich was covered in. Also, our sides of mac and cheese, sweet potatoes, and cornbread were some of the best we had ever tasted, we all agreed. After this, we headed to the arena and reached our seats. The crowd was very thin for the first ten minutes of the game, as usual due to the normal gridlock fans face while trying to get to the game. The first period was fairly uneventful, with Merrimack controlling play for the first half of the period, and only at the very end of the period did the Huskies start to play well and finally generate scoring chances. Still, the period ended scoreless, with Merrimack out-shooting UConn, 12-6. During the second intermission we walked over to the opposite side of the arena to see the team come out and JC and I high-fived them as they came out of the locker room, which is always cool. We must have given them good luck because soon after the Huskies took the 1-0 lead. We walked back around to our seats and as we came to the top of the section, UConn scored. Jesse Schwartz picked off a Merrimack pass and walked in on goal and rifled a wrist shot by Merrimack goalie Colin Delia. We weren’t in our seats for the goal but we had a great view and the Brass Bonanza blasted through the XL Center as we walked down the stairs to our seats. The Huskies then doubled their lead just over seven minutes later on a power-play goal. Jesse Schwartz received a pass from Miles Gendron, and let a shot go but the shot deflected off a Merrimack defender and right to Jeff Wight who buried the puck into the wide open side to make it 2-0 with his first career goal. Unfortunately, JC and I missed the goal, because we had looked away for a split-second while the face-off was happening, as the Jonathan the Husky Dog had come into our row. Then, we were startled by the the blaring of the goal horn and realized UConn had scored. We were thoroughly disappointed we missed it, but at least we got to see the replay on the jumbo tron. The Huskies continued playing well, out-shooting the Warriors 15-7 in the period, and held the lead going into the third. 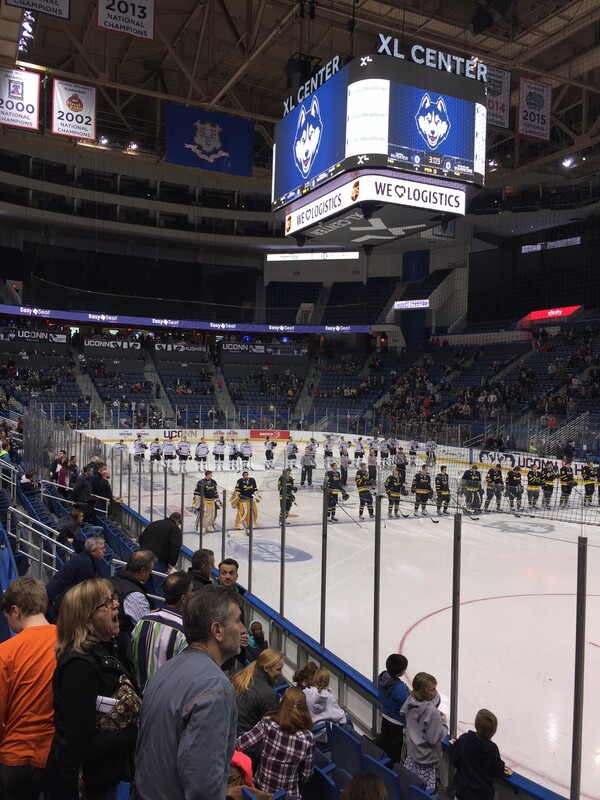 Time passed quickly during the intermission, as with tricycle races and the now-classic hockey-style family feud that occur on the ice during the second intermission, even intermissions at UConn Hockey games offer excitement. As for the third period itself, the Huskies came out flying, but soon Merrimack took command, out-shooting the Huskies 12-7, and clawed their way back into the game. The Warriors scored their first goal to cut the Huskies’ lead to 2-1 just over seven minutes into the third, as Warrior Ludvig Larrsson buried a feed in front into the top of the net. The XL Center got a little quieter as everyone wasn’t nearly as confident now for a UConn win. 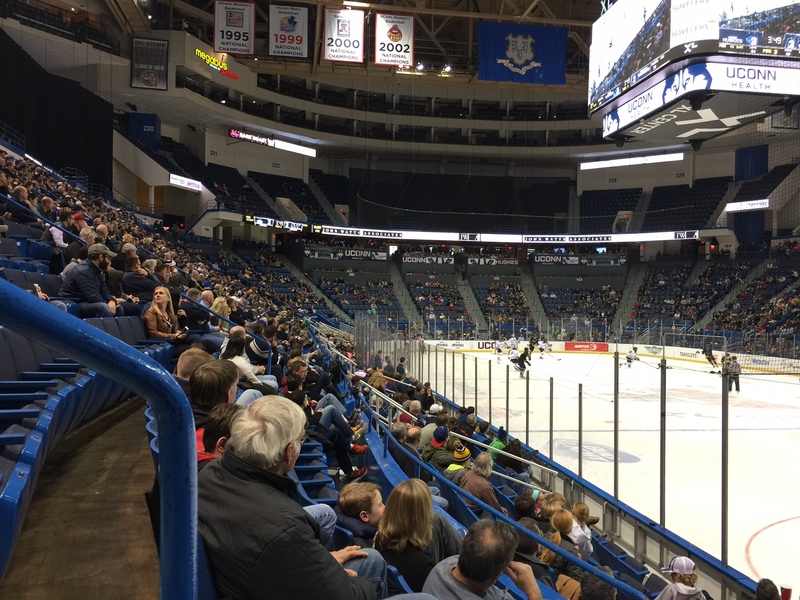 Merrimack silenced the XL Center with the game-tying goal that resulted in one loud groan coming from the crowd of over 4800 fans at the XL Center, including JC, Christine and me, as a Marc Biega shot beat Rob Nichols stick-side on a 5-on-3. The Warriors shocked everyone by taking the lead just 48 seconds later off a shot by Brian Christie who buried it top-shelf to make it 3-2 Merrimack. 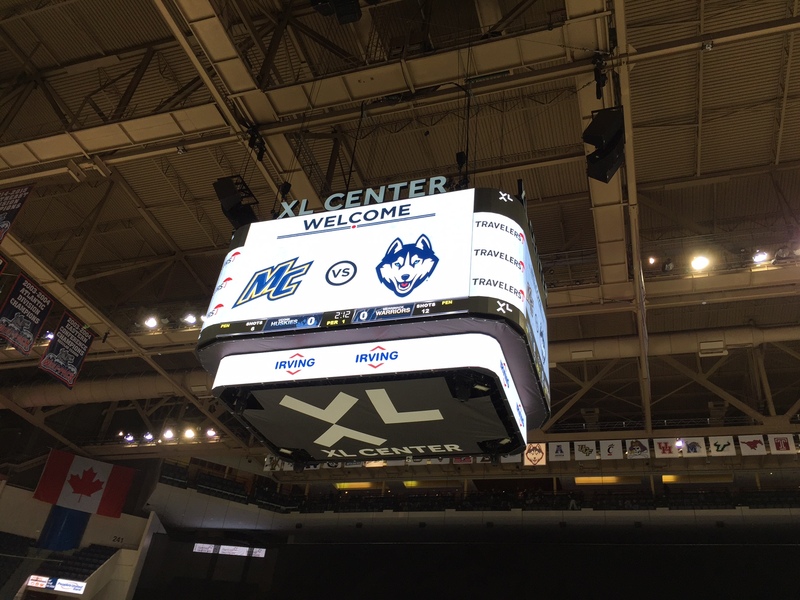 And here is where the fans at the XL Center showed their unbelievable loyalty to their favorite Huskies. As JC, Christine, and me groaned after Merrimack took the lead off of two power-plays from two penalties on the Huskies that were not legit at all and got booed by fans, everyone in attendance gave the Huskies a loud standing ovation, as the center ice faceoff commenced after the go-ahead goal by the Warriors, accompanied by a “Let’s Go Huskies” chant that blasted through the building to try and give the Huskies energy to tie the game. The Huskies had energy, as they were visibly frustrated with what had just surpassed, and were skating circles around Merrimack, but could not even get a shot on net. 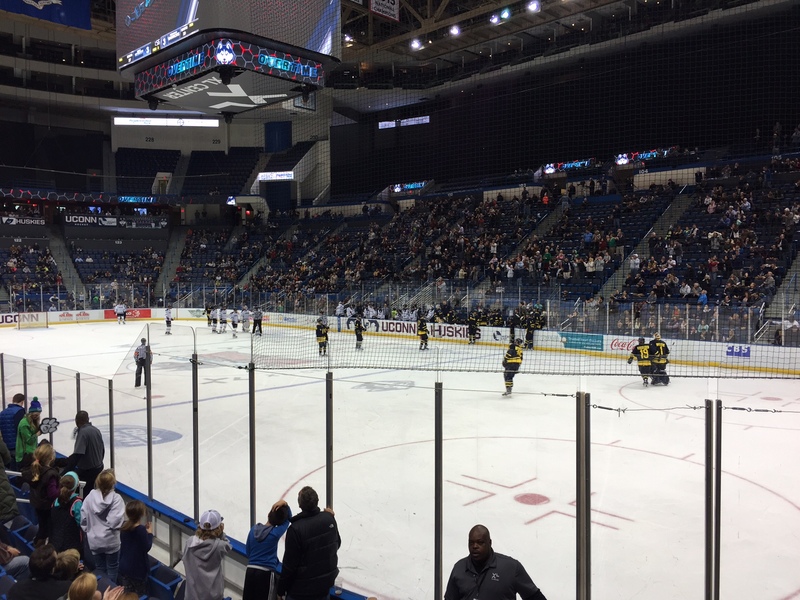 However, with exactly a minutes and 40 seconds remaining in the game Merrimack player Marc Biega was called for hooking and the XL Center stood up to applaud madly the Huskies going on the power-play. 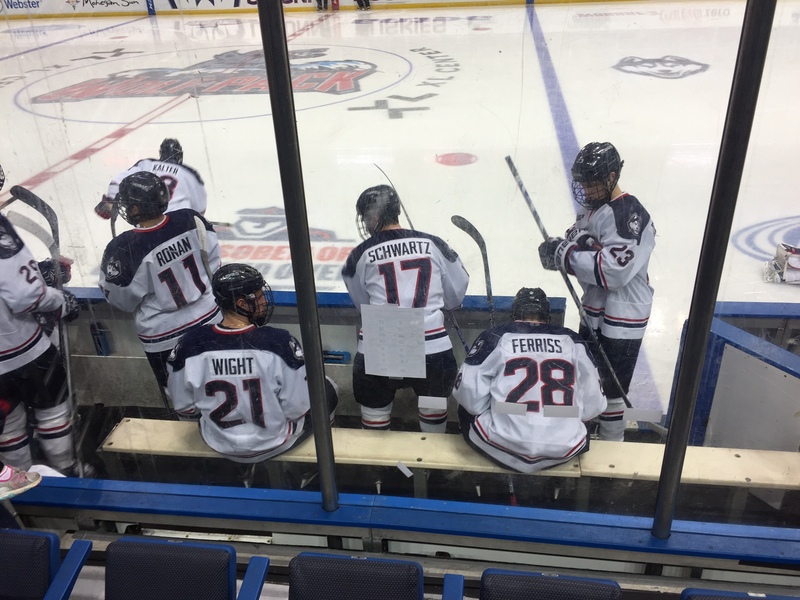 We were really hopeful for the Huskies had scored their last goal on the power-play. My hopes were a little deflated when the Warriors cleared the puck right off the draw, but the Huskies tore back into the zone and got set up in the zone. Then, it happened. David Drake took a pass at the blue-line and sent the puck immediately over to Joseph Masonius who let a monster slap-shot go from the top of the right circle that found its way through traffic and into the back of the net to tie the game, 3-3. Christine, JC, and I saw the net go back, and JC and I jumped up and went ballistic, as with 1:14 remaining, UConn had tied the game! 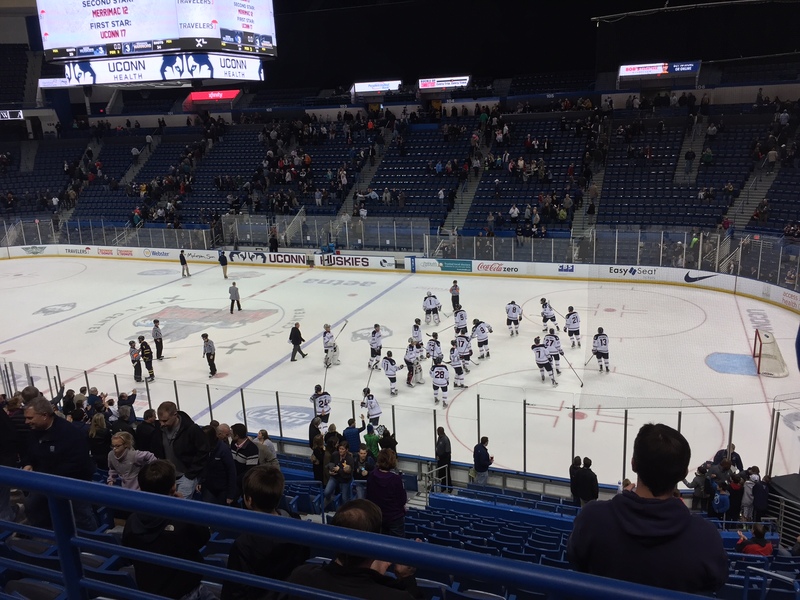 The XL Center erupted with the game-tying and didn’t stop cheering until the game was over. The game then went to overtime, where the Huskies were out-shot 3-1, with the Huskies only shot coming from Tage Thompson, that hit the post. For the game, the Huskies were out-shot 34-29, with Rob Nichols making 31 saves. The Huskies went 2-for-5 on the power-play, while the Warriors went 2-for-4. All in all, we all agreed it was one of the most exciting games we had ever been to, because of the dramatic game tying goal in the final minute of play. After the game, we finished out our night by going to Sweet Frog to get some frozen yogurt and then headed back to my house. 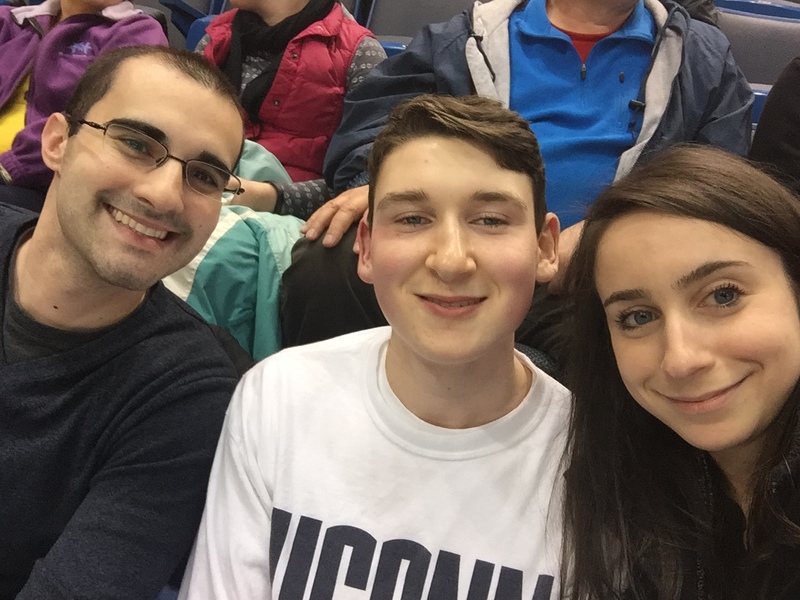 I had a lot of fun going to a UConn Hockey game and having a night out with my cousins, and the three of us agreed we have to make this a yearly tradition! Christine and Jonathan. Sounded like a fun packed night.